While the present generation is better educated than previous ones, there is room for improvement in Irish education. Not enough time is given in primary schools to foreign languages, science, and maths, and too much is given to learning the two national languages. Is é seo an cáineadh atá á dhéanamh ar an gcóras oideachais in Éirinn ag an iar Thaoiseach John Bruton agus é ag scriobh san Irish Times ar an oideas atá aige chun an tír a chur ar ais ar a cosa arís. Níl sé ráite go follasach aige ach is dócha go dtuigimíd cén teanga náisiúnta a mholfadh John Bruton laghdú a dhéanamh ar an riar ama atá ar fáil di sa chóras bhunscolaíochta. We should reallocate a couple of hours a week on the primary school timetable to science, maths and a foreign language. Nilim i gcoinne níos mó eolaíochta nó matamaitic nó, fiú, teanga iasachta, a mhúineadh do pháistí sa bhunscoil. Tá mo mhac féin ag freastal ar bhunscoil ina múintear Iodáílis. Agus Gaeilge/Gaoluinn. Ach is dearcadh gearr radharcach neamh eolaíoch atá á mholadh ag an iar Thaoiseach. Sa chéad dul síos ní mór teangacha a mhúineadh mar is ceart sa tír seo, le go mbeidh na daltaí ábalta í a labhairt nuair a fhagann siad an scoil. Cé mhéid airgid a bheadh sábhailte againn dá mba rud é go mbeadh ard chumas sa Ghaeilge i measc na gcailíochtaí atá ag ár stát seirbhísigh? Is léir freisin go bhfuil deacrachtaí ag daoine le teangacha iasachta agus an Bhéarla féin sa tír seo. An Taoiseach féin, Brian Cowen, is í ‘jargon’ an teanga is dúchasaí aige. De réir gach taighde atá déanta, cuidíonn foghlaim teanga agus tú óg, sa chóras tumoideachais go h-áirithe, le cumas an dhuine óig tuilleadh teangacha a fhoghlaim agus iad ag fás suas. Mar sin, más amhlaidh go dteastaíonn ón Uasal Bruton go mbeadh cumas teangacha iasachta ag an nglúin óg, ní gá do moladh go mbeadh níos lú ama á chaitheamh leis an nGaeilge agus leis an mBéarla. Ní gá níos mó áma a chaitheamh leo, seans, ach go gcaithfí an t-am atá á chaitheamh leo níos éifeachtaí. Nílim ag lochtú na múinteoirí as an teip seo. Creidimse go bhfuil ár gcóras oideachais seanachaite, gur córas scruduithe é seachas córas oideachais, agus go gciallaíonn sin go bhfuil daltaí á dhíriú ar an Ard Teist agus ‘pointí maithe’ a scóráil seachas ar na rudaí ar ghá doibh bogadh chun tosaigh sa saol a fhoghlaim. Cinnte tá gá measúnú neamhspleach a dhéanamh ar gach dalta agus na talannaí is na treithe atá acu a aimsiú agus a spreagadh. Ach is múnla ó ré Victoria an scrúdú mór seo ag deireadh do thréimhse scolaíóchta ina gcaitheann tú gach rud atá ar eolas agat a chaitheamh amach ar leathnach laistigh de thrí uair a chloig! 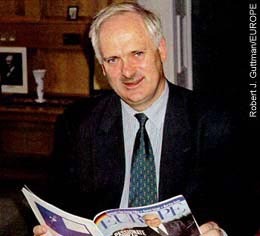 De réir an mhúnla seo a fheidhmíonn leithéidí John Bruton agus Ed Walsh. Creideann siad má fhoghlaimíonn tú an Ghaeilge, go bhfagann sin níos lú spáis san inchinn chun teangacha eile a fhoghlaim. Cé chomh cloch aoiseach is atá an dearcadh sin? Táimíd ag caint ar an ré Iurassach is dócha. Is sean phort agam é go bhfuil easpa mór acmhainní oideachais ar lucht múinte Ghaeilge (agus i nGaeilge) agus go bhféadfaí an t-airgead atá á úsáíd chun cáipéisí nach léitear i dteanga ar bith a aistriú ó Bhéarla go Gaeilge ar na leabhair seo atá gá leo agus leitheoirí ag fánacht orthu go cí ocrach. Teip ár gceannairí i ‘nGluaiseacht na Gaeilge’ agus sna Pairtithe Polatúla atá a n-inchinn lán le caint ar ‘chearta teanga’ agus a leithéid ach nach dtuigeann siad an rud ceart le déanamh chun an teanga a thabhairt slán. Agus ar eagla na mí thuisceana, nílim ag iarraidh obair a bhaint d’aistritheoirí. Daoine árd chumasacha iad seo a fhéadfaí na scileanna atá acu a chur i bhfearas go h-eifeachtach ag aistriú is ag cumadh téacsleabhair is acmhainní dá leithéid, abhair a bheadh eileamh orthu ag léitheoirí, seachas ar an mhaorláthas ar mire. Racht na maidine, curtha díom…..bíodh lá deas agaibh…. Foilsiú: 30/03/2010 . igaeilge a d’fhoilsigh. Ranganna: An Ghaeilge, Cúrsaí Reatha, Cultúr. Clibeanna: Aistriúcháín in aisce, Brian Cowen, John Bruton, Maorláthas Ar Mire. Is cosúil, de réir tuairiscí, go bhfuil sé ráite ag an dTaoiseach, Brian Cowen, NACH bhfuil sé i gceist aige glacadh le moladh Mhic Charthaigh deireadh a chur leis an Roinn Ghnóthaí Pobail, Tuaithe agus Gaeltachta. Níl a fhios agam. Sa chéad dul síos, ní raibh i gceist ag Tuairisc Mhic Carthaigh ach liosta de chiorruithe a fhéadfaí a dhéanamh ar son choigiltis de bhreis is €5bn don bhliain seo – nó, mar is léir anois, an bhliain seo chugainn. Mar sin ní bheadh morán airgid á shábháil tre deireadh a chur leis an Roinn seo – cé nach bhfuil aon chinnteacht ann go dtiocfadh na deontais éagsúla atá ag teacht ón Roinn slán ón tua atá á bhagairt. Dar liomsa, tá gá le athshamhlú agus athstruchtúrú dá réir ar an nGaeltacht agus an slí a roinntear airgead ar thograí Ghaeilge agus ní miste liom an slí a tharlaíonn sin. Níl an ‘status quo’ ina cur chuige cothrom ná ceart don ré seo nó don aimsir atá romhainn. An deacracht a bhí agus atá le moltaí Mhic Carthaigh go bhfuil siad ró dhubh agus bán – ní aithníonn siad go bhfuil an maith á chaitheamh amach in éineacht leis an olc. Cad is fiú deireadh a chur le Scéim na bhFoghlaimeoirí Ghaeilge nuair a ghineann an scéim sin i bhfad Éireann nios mó ioncaim don Ghaeltacht – agus don statchiste – ná an bhuninfheistíocht. Mar eacnamaí, is léir nach bhfuil fios a ghnó ag an tUasal Mac Carthaigh. An oibríonn Scéim Labhairt na Gaeilge? Ní chreidim é. An mbeadh sé níos fearr an t-airgead sin a chaitheamh ar leabhair chearta [nó acmhainní ar líne] do pháistí scoile na Gaeltachta – creidim é. Níl a leithéid ar fáil faoi láthair. Ar ndóígh, bheadh a leithéid ina bhuntáiste do gach páiste, cibé an raibh siad ina gcónaí sa Ghaeltacht nó lasmuigh. Ní luíonn an moladh atá aige go gcuirfí deireadh le hUdarás na Gaeltachta le ciall ach an oiread. 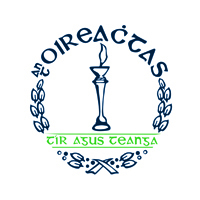 Cruthaíonn an aisínteacht seo go leor postanna sa Ghaeltacht agus tá siad thar a bheith eifeachtach á dhéanamh seo ar chostas nach mó é ná costas na bpostanna a chruthaíonn leithéidí Enterprise Ireland/Fiontar Éireann. Ar ndóigh, is léir nach bhfuil ceantar lár Chorcaí nó ceantaracha maguaird na nGaeltachtaí eile ar radar FÉ nó is beag tionscail atá lonnaithe sna ceantracha sin ag FÉ le blianta beaga anuas. Cinnte is reigiún speisialta an Ghaeltacht. Ach is é an slí go bhfuil sí speisialta faoi láthair ná go bhfuil sí imeallaithe ag an bpobal mór agus na h-údaráis. Tá leathan-bhanda níos moille sa Ghaeltacht, tá na bóithre níos measa, tá an bonneagar ar chaighdeán níos ísle, ní ann do chóras iompair. Ach toisc go bhfuil na deontais suaracha ar nós Scéim Labhairt na Gaeilge ann, deitear go bhfuilimíd ag crú go deireadh bó bainne an Stáit anseo sa Ghaeltacht. Tuairiscíodh freisin go ndúirt an Taoiseach go bhfoilseofar Plean 2028 roimh deireadh na bliana. Níor thug sé le fios cén bhliain…. Tá freagra substaintiúil tugtha ag Conradh na Gaeilge ar mholtaí Mhic Charthaigh agus tá sé ar fáil anseo. Creidim go bhfuil gá le plean substaintiúil anois ó phobal na Gaeilge agus na Gaeltachta chun sinn féin a chur in oiriúínt do threimhse amach romhainn ina mbeidh deireadh le sruth na ndeontaisí. Ní bua é seo ach gairm dúiste. Foilsiú: 28/09/2009 . igaeilge a d’fhoilsigh. Ranganna: An Ghaeilge, Cúrsaí Reatha. Clibeanna: Éamon Ó Cuív, Bórd Snip Nua, Brian Cowen, Colm McCarthy, Taoiseach.